Who doesn’t love doner kebabs? With all its tender meatiness that’s perfectly charred and oozing with perfect grill goodness, and that exciting explosion of flavor from all the spices in it, there’s no reason not to love doner kebabs. But did you know that doner’s are not a class of its own? There are a whole lot of other similar dishes that originated from different parts of the world. Popular history has it that the kebabs were created by traveling Ottomans. While the Ottomans traveled greatly all the Middle East, through the Mediterranean, and then in some parts of Europe, skewered meat on a grill became part of their nomadic cuisine. Each regional stopover adapted the concept of cooking meat in skewers over open fire. And thus, the world eventually saw the birth of different doner kebab-esque treats – each with its own regional flare and distinguishing flavors but all equally yummers. Iskender kebab – this kebab originated in the Bursa region of Turkey, the Iskender kebab is served in an oblong plate with a flatbread base. The meats are placed on top and lathered with tomato-based sauce. It is served with melted butter on top and yogurt on the side. Check out Doner G’s version of the Iskender. Pilavustu – this is all the beauty and deliciousness of the doner kebab served over rice pilaf. Gyros –they are stacked meats full of the flavors of the Greek islands. Gyros can be made of beef, mutton, veal, chicken, or pork. It could also be just cheese, of which haloumi or feta is the top choice. Like doner kebabs, they are popularly served on pita bread but they can also appear on sandwiches. Other fillings include tomatoes, onions, and the signature tzatziki. 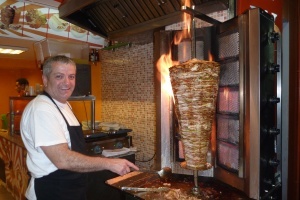 Arabia – another close neighbor of Turkey has a popular doner kebab-ish dish. It is so closely related to the Turkish gyro that in fact, the origin of its name comes from a Turkish word that means “turning”. Shawarma – the special stacks of meat are shaved and placed either on pita bread or the Armenian flatbread called lavash. It is served with a variety of vegetables including eggplants, cucumbers, pickles, rhubarbs, and cabbage among others. In many places, too, a shawarma wrap is stuffed with French Fries to absorb all of the oozing sauce that come with it. Yum! Al pastor – made of pork marinated in chilies, Mexican spices and an added tropical flavor: pineapples! The al pastor also gets a healthy addition of natural red dye called achiote before being stacked on the spit called Trompeta. The al pastor is served with special chili salsa, onions, the Mexican staple herb cilantro, lime, and surprise: pineapple! The al pastor is served on flour tortilla. 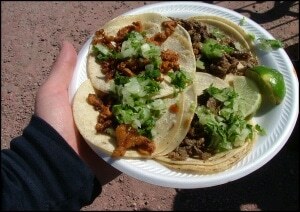 Tacos arabes – Tacos arabes use the exact same meat stacks in al pastor but is served on pita bread. Technically, it is not invented in Mexico but this version is invented in the United States by Mexican immigrants. Now enough with all this conversation about doner kebabs and all its international cousins – head on over to Doner G Anaheim or call (714) 956-8545 for orders, deliveries, and pickups. We are also available in Irvine – visit us or call (949) 861-2627!